Journey into Space was written by Charles Chilton and ran for over 60 episodes during the 1950s. There were three series. The first, A TALE OF THE FUTURE, was set in the far off future of 1965 and described Man's conquest of the Moon. After a failed attempt to launch a rocket in New Mexico, Jet Morgan and his crew make the first trip to the Moon in the rocketship Luna. Despite all known scientific facts they soon realise that they are not alone. The main characters were Captain 'Jet' Morgan (Andrew Faulds), Lemmy (David Kossoff) and Sir William Morgan (Wilfred Walter). Various other parts were played by Guy Kingsley Poynter, Bruce Beeby, Don Sharp, Errol Mackinnon and Mark Baker. The music was composed and conducted by Van Phillips. Derek Guyler played 'the voice of the time traveller'. The recording of the original series in 1953 was not kept since, at the time, it was not realised just how popular the series was going to be. In the second serial, THE RED PLANET, which was set in the early 70's, Faulds continued to play Jet, David Kossoff was Lemmy, Guy Poynter played Doc and Bruce Beeby was Mitch. David Jacobs and Anthony Marriott also took part. Jet Morgan, in his bright blue flagship Discovery, headed the fleet on a 35 million mile round trip to Mars. The expedition both to and across the surface of the mysterious red planet is fraught with danger and spells near disaster for the space exploration fleet. In the final series, THE WORLD IN PERIL, Faulds returned as Jet, Alfie Bass as Lemmy, Guy Poynter as Doc, and Don Sharp played Mitch. Also David Jacobs appeared once again. This final series ended in 1956. 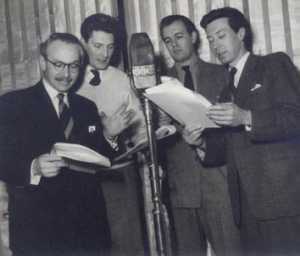 Eventually, Charles Chilton 'wrote-out', about five episodes of the original story, when it came to be re-recorded for the Overseas Service of the BBC in 1958. It was renamed 'OPERATION LUNA'. This version starts with the dramatic take-off to the Moon whereas the original story took several episodes to get to the same point. Charles Chilton's autobiography published in August 2011 along with scripts of The Journey into Space series. A Dutch-language version of the first three series of Journey into Space was broadcast in the Netherlands by Katholieke Radio Omroep (KRO) in 19551958 under the title Sprong in het heelal ("Leap into the universe"). Translation was by Eddy Franquinet and the main character roles were played by John de Freese (Jet Morgan), Adolf Bouwmeester / Louis de Bree (Doc Matthews), Jan van Ees (Mitch Mitchell), and Jan Borkus (Lemmy Barnett).